Proximity technologies and solutions have been attracting the attention of marketers, businesses and investors alike for the past few years and this interest has only been growing. This enthusiasm in the proximity market can be attributed to the pace at which the industry has been growing. Today, there are a wide range of proximity solutions and if you have been following the updates from the proximity market, I’m sure you would’ve heard the terms beacon, Eddystone, Physical Web and iBeacon. What exactly are these solutions? How do they work? What differentiates each of them? These are very critical questions that need to be clearly understood and analysed by any business before embarking on proximity-based initiatives. In this post, we do exactly that – provide a clear understanding of how Eddystone, the Physical Web and iBeacon technologies work. In order to understand these terms, let us first understand what beacons are. Beacons are low-cost, low-energy transmitters or sensors that aim at connecting the physical world (or objects in the physical world) with the digital world (through smart phones). Beacons are designed for a short signal range and they leverage Bluetooth Low Energy (BLE) to transmit digital information to smartphone users at strategic locations (as required by businesses). These hardware devices can be configured to be compatible with both Eddystone and iBeacon formats. 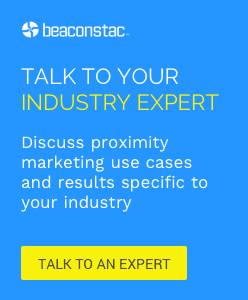 To get an in-depth understanding of how beacons work, from range to battery life, to device compatibility, you can read our Beacon FAQs blog. What is Eddystone and how does it work? Eddystone is a beacon format that was introduced by Google in July 2015 and it leverages the fundamental ability of beacons (broadcasting content to smartphone users in a specific area) to offer a wide range of solutions from what was previously possible through Apple’s iBeacon format. Eddystone is an open-beacon format (meaning that the format is freely available on Github for developers to download and integrate into their proximity solutions) and offers three payload types – Eddystone URL, Eddystone UID (unique ID) and Eddystone TLM (telemetry information). While the Eddystone format has many advantages, the biggest advantage is that it allows for proximity interactions without the need to have a native app and is compatible across devices (Android and iOS). At Google I/O 2015, Eddystone became even more powerful with the introduction of two new APIs – Proximity Beacon API and the Nearby API. The Proximity beacon API essentially revolves around how developers can manage the data collected through beacons and smartphones. The Nearby API is available to developers and aims at putting proximity features into devices at the OS level instead of at the app level. The Nearby API encompasses three formats – Nearby Messages, Nearby Connections and Nearby Notifications. The entire proximity ecosystem, as envisioned by Google and supported through Eddystone beacons is called the ‘Physical Web’ and represents the convergence of the digital and physical worlds. Eddystone beacons and the Chrome browser (the channel through which Eddystone beacons transmit content) are the backbone of the Physical Web. Largely speaking, the Physical Web is a discovery service where beacons scan for nearby smartphones and triggers permission messages to them. Once smartphone users receive this message, they need to specifically allow access to the Physical Web. After the access is granted by users, a list of all nearby beacons become visible on their smartphones. The beacons that form part of this Physical Web can then broadcast relevant URLs that are tailored to the users’ specific location. The Physical Web is a massive step in the IoT space and without doubt offers tremendous promise to brands and businesses. With the Physical Web and Eddystone beacons, businesses can now easily send targeted and location-specific content to customers’ smartphones, via the Chrome app. The Chrome app also enjoys a sizeable install base and recently hit 1 billion downloads on the Google Play Store. This makes Physical Web interactions all the more attractive to businesses, as it ensures wide spread customer reach. Given the growing need for location-based solutions, the Physical Web will also prove to be very useful to customers/users. It has the power to make search easier and in context with actual physical locations. For instance, with Nearby Notifications, passengers at a bus stop can be sent notifications that contain the url to the website that tracks bus timings in real time. Another good example is sending customers the registration form through a Nearby Notification when they enter a hotel in order to optimise the check-in process. Other such interesting Physical Web examples have been discussed in an earlier blog. What is iBeacon and how does it work? iBeacon was the first beacon-based proximity solution that was introduced by Apple in 2013. Like the Eddystone protocol, iBeacon technology also leverages beacons to send contextual, personalized and location-specific content to customers/users, however, only through a native beacon-enabled app. Under the iBeacon protocol, beacons simply send a unique identifier (UUID) to a beacon-enabled app, to inform the app that it is entering beacon range. This signal makes the app aware that it’s time to send the user a notification and triggers a message or performs an action. iBeacon technology is both Android and iOS compatible, however, it is only native for iOS. Being the pioneer in the industry, iBeacon technology has also gained significant traction in the proximity industry. However, the need for an app has led to only big brands and market leaders with the resources to build and integrate an app to leverage the technology. There are other differences between the technologies, like, security and privacy aspects and APIs used; you can read more about the differences in our earlier blog – iBeacon vs. Eddystone. – Does away with app clutter – With the market flooded with apps, users often uninstall apps for a variety of reasons from the need to try new apps to saving phone storage. Thus, it is often hard and expensive for branded apps to enjoy continued screen space on customers phones. Eddystone addresses this problem very efficiently by directly transmitting through Chrome, which has a huge install base. – Ability to re-use web content – Most brands have an online presence today, through a website. This content is often dynamic to reflect the changing needs of the business. Eddystone allows brands to directly transmit URLs (as well as change URLs if needed) which in turn re-routes customers to the intended website and mobile experience. – Results in cost savings – Brands can completely do way with building and maintaining an app in order to deliver timely, engaging mobile experiences to customers through the Eddystone format. This can result in considerable cost savings for brands. – Ability to integrate with other Google solutions – By leveraging Eddystone beacons, brands can integrate with other Google products and services, as well as their own and their partners’ apps; thus making the solution extremely versatile. Lastly, the Eddystone protocol is extensible, with Google promising to make the solution more robust by building new capabilities for the beacon format as we move forward. Thus, given the underlying benefits, brands looking at proximity solutions should certainly explore and invest in Eddystone beacons and the Physical Web. As Unicast’s excellent Proxbook makes clear, Eddy beacon spread will be largely owned by companies of significant size, with developers for whom APIs and SDKs are daily bread. For small operators looking to serve SMBs friendly dashboards that allow for changing URLS and meta data without physical contact or work-arounds, content creation (like Phy.net’s cover cards, and Beeemapp’s coupons, info cards and more), metrics, and access to battery charge, signal strength and advertising interval are solid gold. Can you add any to my short list?